معدولیت, رضا, قاسمی قلعه بهمن, احمد, محمد حنیفه, قاسم. (1396). تاثیر میرایی بر پاسخ غیرخطی ارتعاشات اجباری نانوکامپوزیت های زمینه گرافنی. علوم و فناوری کامپوزیت, 4(2), 141-150. رضا معدولیت; احمد قاسمی قلعه بهمن; قاسم محمد حنیفه. "تاثیر میرایی بر پاسخ غیرخطی ارتعاشات اجباری نانوکامپوزیت های زمینه گرافنی". علوم و فناوری کامپوزیت, 4, 2, 1396, 141-150. معدولیت, رضا, قاسمی قلعه بهمن, احمد, محمد حنیفه, قاسم. (1396). 'تاثیر میرایی بر پاسخ غیرخطی ارتعاشات اجباری نانوکامپوزیت های زمینه گرافنی', علوم و فناوری کامپوزیت, 4(2), pp. 141-150. معدولیت, رضا, قاسمی قلعه بهمن, احمد, محمد حنیفه, قاسم. تاثیر میرایی بر پاسخ غیرخطی ارتعاشات اجباری نانوکامپوزیت های زمینه گرافنی. علوم و فناوری کامپوزیت, 1396; 4(2): 141-150. در این مطالعه، پاسخ غیرخطی نانوکامپوزیت‌های گرافنی نسبت به تشدید هارمونیک بررسی شده است. از اهداف این مقاله ارایه روابط دینامیکی مواد نانو‌کامپوزیتی است که در آن اثرات هم‌زمان غیرخطی‌های هندسی و میرایی انرژی ناشی از محیط ویسکوالاستیک خارجی و میرایی داخلی در نظر گرفته شده است. بر اساس نظریه الاستیک غیرموضعی، روابط غیرخطی کرنش- جابه‌جایی وون- کارمن، معادله اساسی حرکت غیرخطی با روش همیلتون به‌دست آمده است و سپس با استفاده از روش گالرکین، به یک معادله دیفرانسیل معمولی غیرخطی ساده‌سازی می‌شود. این معادله برای یافتن رابطه فرم بسته بین فرکانس- دامنه ارتعاش ورق گرافنی چهارسر تکیه‌گاه ساده به‌صورت تحلیلی به‌وسیله روش مقیاس‌های چندگانه حل می‌شود. مطالعه پارامتری هم به‌صورت ویژه بر مجموعه‌ای از عوامل هم‌چون پارامتر غیرموضعی، نسبت ابعادی و هر دو ضریب میرایی (داخلی و خارجی) و نیز فرکانس نیروی تحریک خارجی انجام شده است. نتایج به‌دست آمده اثرات سختی افزایی غیرخطی را در حالت تشدید اولیه و همچنین پدیده‌های قابل توجه دیگری را برخلاف تحلیل خطی نشان می‌دهد. Liu, Y. Dong, X. and Chen, P., “Biological and Chemical Sensors Based on Graphene Materials,” Chemical Society Reviews, Vol. 41, No. 6, pp. 2283–2307, 2012. Lee, H.L. Yang, Y.C. and Chang, W.J., “Mass Detection Using a Graphene-Based Nanomechanical Resonator,”Japanese Journal of Applied Physics, Vol. 52, No. 2, pp. 25-101, 2013. Jo, G. Choe, M. Lee, S. Park, W. Kahng, Y.H. and Lee, T., “The Application of Graphene as Electrodes in Electrical and Optical Devices.,” Nanotechnology, Vol. 23, No. 11, pp. 11-21, 2012. Dai, M.D. Kim, C. and Eom, K., “Nonlinear Vibration Behavior of Graphene Resonators and Their Applications in Sensitive Mass Detection,” Nanoscale Res. Lett., Vol. 7, No. 499, pp. 1–10, 2012. Pradhan, S.C. and Kumar, A., “Vibration Analysis of Orthotropic Graphene Sheets using Nonlocal Elasticity Theory and Differential Quadrature Method,” Composite Structures., Vol. 93, No. 2, pp. 774–779, Jan. 2011. Amabili, M. and Farhadi, S., “Shear Deformable Versus Classical Theories for Nonlinear Vibrations of Rectangular Isotropic and Laminated Composite Plates,” J. Sound Vib., Vol. 320, No. 3, pp. 649–667, 2009. Golmakani, M.E.E. and Rezatalab, J., “Nonlinear Bending Analysis of Orthotropic Nanoscale Plates in an Elastic Matrix Based on Nonlocal Continuum Mechanics,” Composite Structures., Vol. 111, pp. 85–97, 2014. Firouz-Abadi, R.D. Mohammadkhani, H. and Amini, H., “Vibration Analysis of a Graphene Nanoribbon under Harmonic Lorentz Force using a Hybrid Modal-Molecular Dynamics Method,” International Journal of Structural Stability and Dynamics, Vol. 14, No. 2, pp. 1-16, 2014. Jiang, S. Gong, X. Guo, X. and Wang, X., “Potential Application of Graphene Nanomechanical Resonator as Pressure Sensor,” Solid State Communications., Vol. 193, pp. 30–33, 2014. Ansari, R. and Ramezan-Nejad, H., "Nonlinear Vibration Analysis of Embedded Multiwalled Carbon Nanotubes in Thermal Environment," In Persian, Journal of Solid Mechanics in Engineering, Vol. 1, No. 4, pp. 11-18, 2008. Jalali, A. and Esmaeilzadeh-Khadem, S., "Nonlinear vibration And Dynamic Stability Analysis Of A Nanocomposite Viscoelastic Microplate Under An Electrostatic Actuation," In Persian, Aerospace Mechanics Journal, Vol. 8, No. 3, pp. 51-68, 2012. Heidari-Rarani, M. Alimirzaei, S. and Torabi, K., “Analytical Solution For Free Vibration Of Functionally Graded Carbon Nanotubes (FG-CNT) reinforced Double-Layered Nano-Plates Resting On Elastic Medium”, In Persian, Journal of Science and Technology of Composites, Vol. 2, No. 3, pp. 55-66, 2015. Fathalilou, M. and Rezaee, M., "A comparison Between Two Approaches For Solving The Governing Nonlinear Equation Of Vibrations Of Electrostatic Micro-Sensors,” In Persian, Modares Mechanical Engineering, Vol. 16, No. 6, pp. 101-107, 2016. Su, Y. Wei, H. Gao, R. Yang, Z. Zhang, J. Zhong, Z. and Zhang, Y., “Exceptional Negative Thermal Expansion and Viscoelastic Properties of Graphene Oxide Paper,” Carbon N. Y., Vol. 50, No. 8, pp. 2804–2809, 2012. Eichler, A. Moser, J. Chaste, J. Zdrojek, M. Wilson-Rae, I. and Bachtold, A., “Nonlinear Damping in Mechanical Resonators Made from Carbon Nanotubes and Graphene,” Nature Nanotechnology, Vol. 6, No. 6, pp. 339–342, 2011. Eshmatov, B.K., “Nonlinear Vibrations and Dynamic Stability of Viscoelastic Orthotropic Rectangular Plates,” Journal of Sound and Vibration, Vol. 300, No. 3–5, pp. 709–726, 2007. Sakhaee-Pour, A. Ahmadian, M.T. and Naghdabadi, R., “Vibrational Analysis of Single-Layered Graphene Sheets,” Nanotechnology, Vol. 19, No. 8, pp. 1-7, 2008. He, X.Q. Wang, J.B. Liu, B. and Liew, K.M., “Analysis of Nonlinear Forced Vibration of Multi-Layered Graphene Sheets,” Computational Materials Science, Vol. 61, pp. 194–199, 2012. Gilchrist, D. Murmu, T. Mccarthy, M. A. and Adhikari, S., “Nonlocal Modal Analysis for Nanoscale Dynamical Systems,” 4th ECCOMAS Thematic Conference on Computational Methods in Structural Dynamics and Earthquake Engineering, 2013. Pouresmaeeli, S. Ghavanloo, E. and Fazelzadeh, S.A., “Vibration Analysis of Viscoelastic Orthotropic Nanoplates Resting on Viscoelastic Medium,” Composite Structures, Vol. 96, pp. 405–410, Feb. 2013. Jomehzadeh, E. and Saidi, A.R.R., “A Study on Large Amplitude Vibration of Multilayered Graphene Sheets,” Computational Materials Science, Vol. 50, No. 3, pp. 1043–1051, 2011. Applied Physics, Vol. 44, No. 13, pp. 1-9, 2011. Liew, K.M. He, X.Q. and Kitipornchai, S., “Predicting Nanovibration of Multi-Layered Graphene Sheets Embedded in an Elastic Matrix,” Acta Mater., Vol. 54, No. 16, pp. 4229–4236, 2006. Shen, H.S., “Nonlocal Plate Model for Nonlinear Analysis of Thin Films on Elastic Foundations in Thermal Environments,” Composite Structures, Vol. 93, No. 3, pp. 1143–1152, 2011. Lin, S.M., “Analytical Solutions for Thermoelastic Vibrations of Beam Resonators with Viscous Damping in Non-Fourier Model,” International Journal of Mechanical Sciences, Vol. 87, pp. 26–35, 2014. Hosseini, S. Mehrabani, H. and Ahmadi-Savadkoohi, A., “Forced Vibration of Nanoplate on Viscoelastic Substrate with Consideration of Structural Damping : An Analytical Solution,” Composite Structures, Vol. 133, pp. 8–15, 2015. Jomehzadeh, E. Saidi, A.R. Jomehzadeh, Z. Bonaccorso, F. Palermo, V. and Galiotis, C., “Nonlinear Subharmonic Oscillation of Orthotropic Graphene-Matrix Composite,” Computational Materials Science., Vol. 99, pp. 164–172, 2015. Pourashraf, S.T. Ansari, R. "Nonlinear forced Vibration Analysis Of Functionally Graded Nanobeams In Thermal Environments By Considering Surface Stress And Nonlocal Effects," In Persian, Modares Mechanical Engineering, Vol. 14, No. 16, pp. 17-26, 2015. Kaghazian, A. Foruzande, H. Hajnayeb, A. and Mohammad Sedighi, H. "Nonlinear Free Vibrations Analysis Of A Piezoelectric Bimorph Nano Actuator Using Nonlocal Elasticity Theory," In Persian, Modares Mechanical Engineering, Vol. 16, No. 4, pp. 55-66, 2016. Eringen, A.C., Nonlocal Continuum Field Theories. Springer, 2002. Reddy, J.N., Mechanics of Laminated Composite Plates and Shells: Theory and Analysis. Crc Press, 2004. Drozdov, A.D., Viscoelastic Structures: Mechanics of Growth and Aging. Academic Press, 1998. Meirovitch, L., Fundamentals Of Vibrations, 2001st Ed. Mc Graw-Hill International Edition. 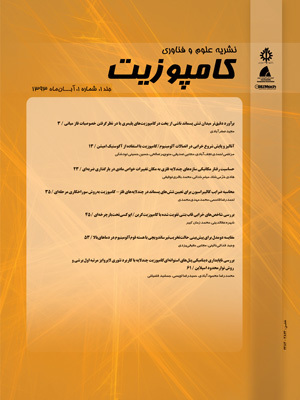 Poorjamsjidian, M. Sheikhi, J. and MahjoobMoghadas, S., “An analytic Solutio Of Transversal Vibration And Frequency Response Of Quanitic Nonlinear Beam,” In Persian, Modares Mechanical Engineering, Vol. 13, No. 15, pp. 2-9, 2013. Rezaee, M. and Jahangiri, R., “Static/Dynamic Instability And Nonlinear Vibrations Of FG Plates Resting On Elastic Foundation Under Parametric Forcing Excitation,” In Persian, Modares Mechanical Engineering, Vol. 14, No. 13, pp. 172-182, 2014. Rezaee, M. and Jahangiri, R., “Nonlinear Vibrations of Sandwich FG Plates Resting on Nonlinear Pasternak Foundation under Primary Resonance Excitation Using Modified FSDT,” In Persian, Modares Mechanical Engineering, Vol. 14, No. 15, pp. 186-198, 2015.